Cracking the cipher of a cracked cipher: The Zodiac Killer. "Zodiac" is an important postmodern work. It's an authentically “new” and even experimental thing attempting, to quote from Susan Sontag's essay "Against Interpretation," to put content in its place. It's very very much a film constructed on a 21st century conception of information as a non-substantive, purely relational digital phenomenon, and the fact that it was shot on video and exists immaterially as digital information is thus not a merely decorative issue but crucial to its meaning. ..."Inland Empire" unfolds in a digital world (a replication of consciousness itself -- hence the title), where events really do transpire in multiple locations at the same time (or multiple times at the same place), observers are anywhere and everywhere at once, and realities are endlessly duplicable, repeatable and tweakable. 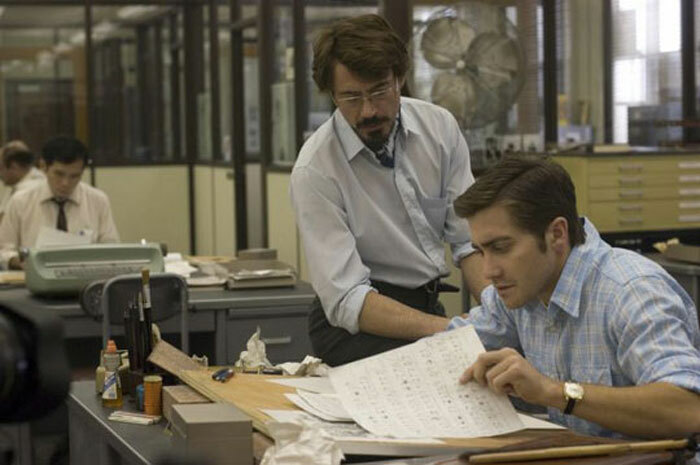 "Zodiac," on the other hand, impressed me as very much an analog film. Yes, it was shot on HD video (though with few of the showy CGI tricks Fincher played with in "Fight Club" and "Panic Room" (2002)), but the narrative, technique and structure of the film are inexorably linear and chronological. That's because "Zodiac" is structured as a procedural, with cops and reporters and amateur sleuths attempting to piece together the identity of a serial killer, based on crime scene evidence, letters from the Zodiac, handwriting samples, encrypted messages, eyewitness accounts, and other detective work. And it's backbreaking, exhausting, manual work. It involves paper files stored in boxes that sit in some evidence room in one county police precinct or another, and there are miles to be driven between them. (There's a repeated joke about not knowing how far away someplace is and underestimating the amount of time it would take to get there and back.) The cops in various jurisdictions don't share a lot of information not just because of a sense of territoriality but because there's too much information, and no way to (digitally) distribute it via the Internet or even "tele-fax." So, seemingly insignificant oversights, errors, omissions and connections go undiscovered because they're spread all over the map, across years of investigations. Thus if the Zodiac unknowable, that is only because he is an emblem of the entirety of the universe. What is masterful about "Zodiac" is that every aspect of its structure plays back upon its central disturbing theme. ''Knowing'' the tiniest thing in the world, precisely, is depicted over and over and in each and every fresh instance, and character perspective until the very end, as fragmentary, incomplete, frustrated, frustrating. What is fascinating and so perplexingly compelling about the last three or four scenes in the film is that cognitively we are given a solution, but it is now empty of affect, reversing and upending all conventional narrative results. The Graysmith character, a cartoonist, works through with the cop played by Ruffalo, a kind of schematic of all the events we have seen over and over, handled, mishandled, misinterpreted; knowledge has become pure form, stretched out precariously as an abstract “story” across the abyss of the lives that have been swallowed up in the failure to become its content. The haunting final scene exquisitely utilizing characters we barely know and can identify, “completes” the abstract search for truth. An i.d. is judged eight on a scale of ten, ten being positive. It and the subsequent crawl gives us everything and nothing. The last third of the movie is indeed a kind of deconstruction of the first two-thirds, as Graysmith (the Chronicle editorial cartoonist who becomes obsessed with the Zodiac case) goes back over the previous police work, and does first-hand reporting/investigating himself, to piece together pieces of the puzzle that were never found, missing, or previously didn't seem to fit. Gross makes a comparison to David Lynch ("Zodiac" is to "Seven" (1995) what "Inland Empire" is to "Mulholland Drive"). I think the most Lynch-like thing about "Zodiac" is that whatever narrative momentum it has is driven by mystery -- our primal need to explain. We want to put the pieces together ourselves -- even if these characters from the past were never able to. We know the identity of the Zodiac Killer was never conclusively determined; but maybe this movie will give us the information we need to solve the crime.... No, it's not likely or logical, but we can't help but crave a solution, no matter how unlikely. Just like the characters do. Watching "Zodiac" I was reminded of a couple of my favorite existential detective stories: Roman Polanski's "Chinatown" (the attempt to see not only what is before your eyes but to intuit what lies beyond the limits of your vision); and (particularly at the end) Ivan Passer's "Cutter's Way," (the attempt to prove someone is "responsible," whether he is or not, because you've made up your mind so that "evidence" comes to mean anything that supports your hypothesis). Interesting that both of these films are made by Eastern European directors, for whom epistemological questions seem paramount: What is the nature and extent of knowledge? Is it ever possible to re-construct (or re-imagine) past events accurately? And even if we know something (the saltwater, the glasses), do we know what it means? As you can probably tell, I'm pretty jazzed about "Zodiac" and I already want to see it again.